Over the past few months, I have come to be a pretty good judge of the quality of hidden object games. I didn’t necessarily set out to be, but when you’ve played them as much as I have, you start to get a sense what separates the good games from the bad ones. Is the premise intriguing or stupid? Are the puzzles too hard, too easy, or just right? Does the game mix different types of puzzles, or stick solely to hidden object puzzles? Does the plot make sense? Do the cut scenes enhance the story? Is the ending satisfying? And so on. Most games that I’ve played tend to get mixed ratings on these criteria. A game with an intriguing premise and solid mechanics, for example, may be marred by a stupid ending. Another game that has a well-written story arc may nevertheless lose me after the first hour because the puzzles are either mind-numbingly easy or eye-searingly difficult. Of all the hidden object games I have played, one of the absolute best was Mystery Trackers: Raincliff, which—fortunately for all of you—happens to be the subject of this review. The plot of Mystery Trackers: Raincliff begins with what I would consider to be a fairly standard set-up for a hidden object game: a bus carrying five students and a driver vanishes after a trip to the mysterious town of Raincliff. You are tasked with finding them, and in short order you arrive in the middle of a seemingly deserted town. However, despite the absence of other people, you soon discover that you are not alone. Footprints appear in the snow before your eyes, hooded and masked figures appear out of nowhere, and an entire set of dinnerware angrily hurls itself at your head. What the &*^% is going on here? The mood of the rest of game carries through that initial sense of unease. The quiet, creepy veneer of the town is occasionally interrupted by jarring, jump-inducing movie sequences . These scenes would be frightening enough on their own, but their effect is heightened by the fact that the animation is so good, it actually looks more like they were filmed than drawn. The Uncanny Valley effect is definitely at work here, but its presence actually enhances, rather than detracts from enjoyment of the game, because nothing about Mystery Trackers: Raincliff is supposed to make you feel “comfortable”. Fortunately, it turns out that the taste of bile in your mouth every time there’s a cut scene is something you do get used to after a while. Lucky me. The other thing I loved about the puzzles was that the game had the perfect balance of hidden object puzzles, mini-game puzzles, and “picking stuff up from around the town and using it somewhere else at an opportune moment” puzzles (Note to Self: I really need to find a better term for that). A lot of hidden object games rely too heavily on the hidden object puzzles, which can get really tiresome after a while, so this was a welcome change. 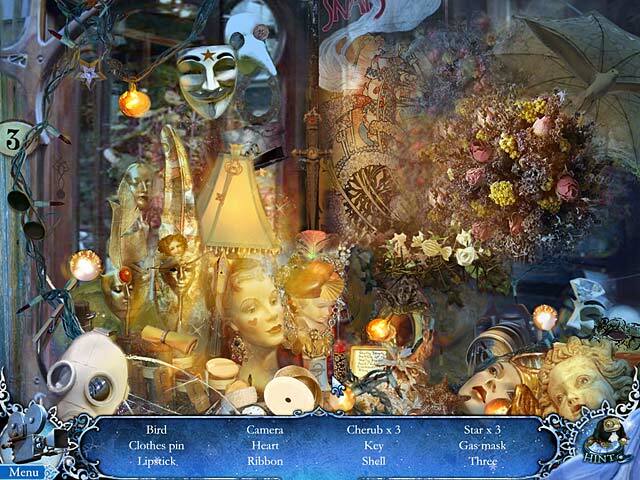 In addition, the hidden object scenes had just the right level of challenge for my eyes, in that they were a) not so easy that I could pick out objects without even needing to know what I was looking for, and b) not so difficult that they made me go blind. Again, this is something I have only come to notice because of the vast number of hidden object games I have played over the last few months, but trust me when I say that after a while, it’s those little marks of quality that you really come to appreciate. Movement within the game was very good as well. Different sections of the town opened up at different points in the game, and I was rarely prevented from going back to any previous areas, so the overall effect was one of expansion as the game progressed. This made the game more challenging, since there were more possible areas to explore; however, the increased difficulty was mitigated by the fact that at any given point in the game, the majority of tasks that needed to be completed confined themselves to a certain chunk of the map, depending on where I was in the story. Also, while there were no explicit “Congratulations! This Area Is Clear!” signs, I could generally tell when an area didn’t require any more tasks. There was very little music in the game, with one very prominent exception. The majority of the game featured only ambient noises; but the cut scenes would crank up the scary music to full blast, adding to the overall jump-inducing effect of the scenes. Moreover, I noticed that the music would continue for about 10-15 seconds after the cut scene had ended and I had returned to the normal gameplay screen, before fading out and back to silence. This gave the movie scenes a reverberating quality that prolonged the feelings of fright, simulating those few terrifying moments after a scary encounter when your heart is still racing—even though the danger has passed—until you are able to calm yourself down. Overall, Mystery Trackers: Raincliff is one of the most well-crafted hidden object games I have ever played. There was really nothing at all to complain about. The puzzles were challenging and balanced, the animation was fantastic, the music was scary, and the plot delivered an interesting and satisfying (if slightly odd) resolution to the initial premise. I highly recommend it to all fans of the genre! Sounds like a fun outing, Gamer Wife. I’ll have to check it out. Good review.